Do you want your Bellingham Port Commissioners to be focused on listening to you, or to be offering corporations and developers the upper hand? In early 2013, the group I am part of, Save Birch Bay, gave a presentation regarding impacts to water from the proposed Gateway Pacific Terminal to the Ferndale City Council. 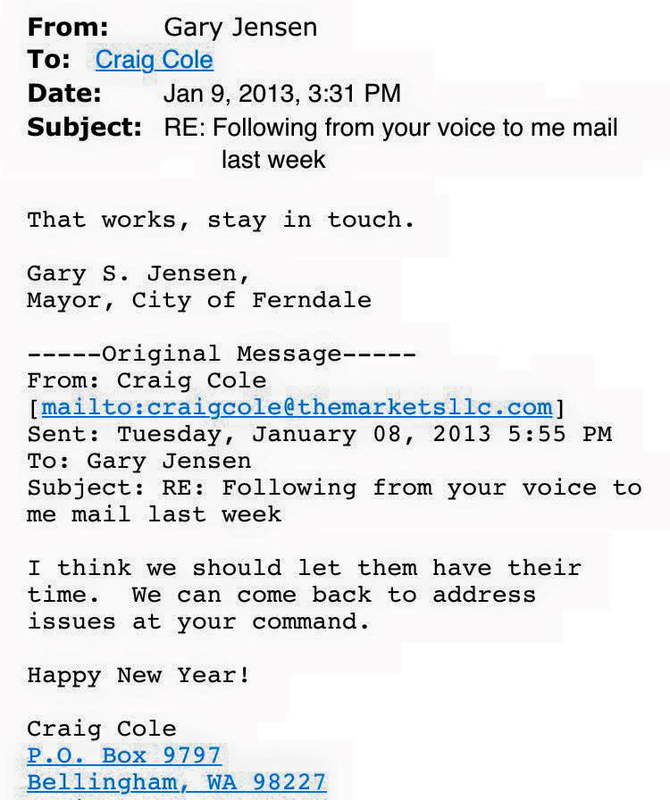 Below, are email communications obtained from the City of Ferndale. 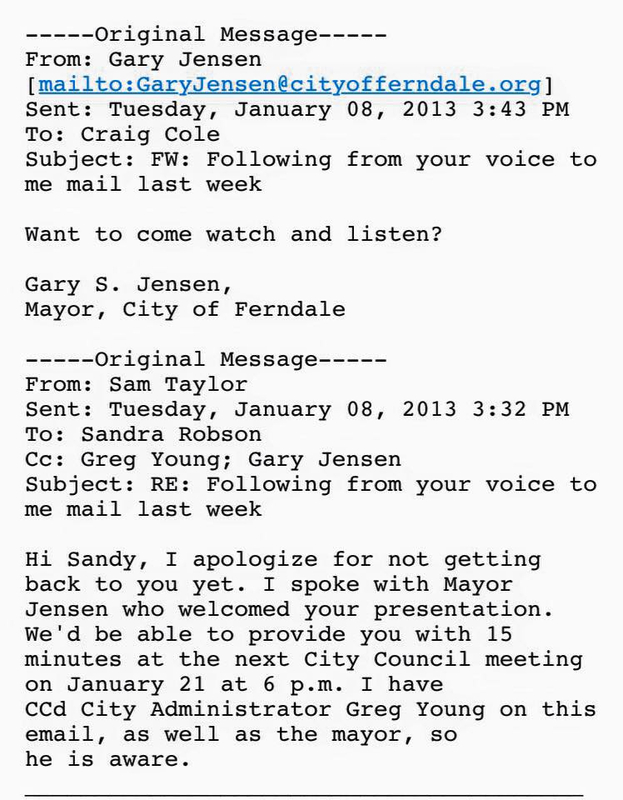 One email was sent to me on January 8, 2013 from then-City Clerk for Ferndale, Sam Taylor, about scheduling Save Birch Bay’s presentation for January 21. What was clear to me from the communications shown below was the extent of detailed effort Mayor Gary Jensen has put into aiding SSA Marine in its endeavor to build and run a 48 million ton per year coal export terminal at Cherry Point. After then-City Clerk Sam Taylor sent his January 8 email to me (which he copied Mayor Jensen on) with a schedule date for Save Birch Bay to present at the City Council meeting, it only took Mayor Jensen 11 minutes to send an email to SSA Marine’s paid spokesperson for GPT, Craig Cole, about our group’s presentation date. Why is an elected official acting like a corporate liaison? Want to come watch and listen? That works, stay in touch. This entry was posted in Commentary, Facebook Post, Information and tagged Bellingham, Craig Cole, Ferndale, Gary Jensen, Gateway Pacific Terminal, GPT, Port of Bellingham, Whatcom County. Bookmark the permalink.